LEADING THE WAY IN FIRE APPARATUS INNOVATIONS, THIS 1996 SPARTAN DIAMOND DA41M CUSTOM RESCUE PUMPER BUILT BY 4 GUYS STAINLESS TANK & EQUIPMENT INC OUT OF MEYERSDALE PA COMES AS A 750 PUMPER 320 HORSEPOWER 950 LB. FT. TORQUE 661 CUBIC INCH CUMMINS M-11 CELECT L6 ENGINE 9.8 MILES PER GALLON @ 70MPH WITH A 68 GALLON FUEL TANK COMBINED WITH AN ALLISON MD 3060P 5 SPEED AUTOMATIC TRANSMISSION FULLY STAINLESS AND ALUMINUM UNDERCOATED WITH OILIZUM RUST INHIBITOR. 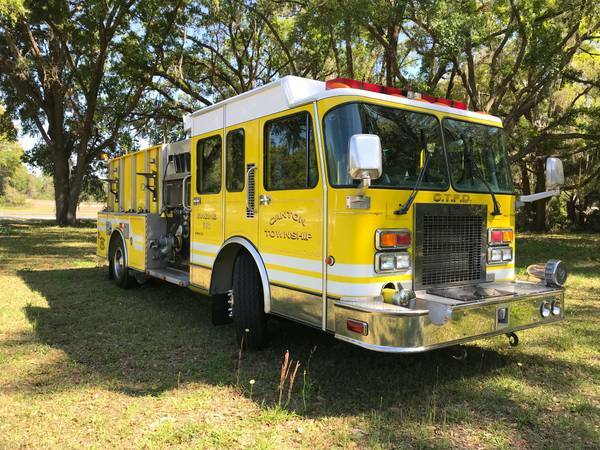 8 MAN ENCLOSED CAB WITH TANK JUMPERS/SCUBA SEATS, DUPONT IMMRON CHROME YELLOW IN COLOR IS FULLY FUNCTIONAL IN EVERY WAY FROM THE DECK GUN, LIGHTS, SIRENS, PUMP, ETC. READY TO WORK AND JUST PULLED FROM SERVICE TO BE REPLACED WITH NEW APPARATUS PER DEPARTMENT REFERENDUM. 750 GALLON 11 GAUGE 304 GRADE STAINLESS STEEL WATER TANK WITH LIFETIME WARRANTY, WATEROUS MODEL CS/YCX 34882W/34883T 1250 GPM SINGLE STAGE MIDSHIP MOUNTED PUMP, ALL GALVANIZED PIPING, PRE-PIPED DECK GUN, RAMCO POLISHED ALUMINUM HEATED MIRRORS, COMES WITH TWO PORTABLE 1500 WATT TELESCOPIC NIGHTFIGHTER LIGHTS WITH HUGE SUPPLY CHORD AND AUTOMATIC ELECTRIC CHORD REEL, VARIOUS SUPPLY HOSE, ATTACK HOSE, AND DRY VAC/HARD SLEEVE SUCTION HOSE. 30’ 1" IN LENGTH, MITSUBISHI MGE 4800 9.5 HORSEPOWER GENERATOR WITH A 5.5 GALLON GASOLINE TANK EITHER PULL STARTS OR STARTS FROM MAIN BATTERY SALE WILL INCLUDE ALL ORIGINAL BLUEPRINTS AND EVERY DIAGRAM FOR THIS APPARATUS INCLUDING, BUT NOT LIMITED TO, ALL SERVICE MANUALS AND WARRANTY INFORMATION(S). THIS IS A ONE OWNER FLEET MAINTAINED APPARATUS READY FOR A NEW DEPARTMENT. THERE ARE NO LIMITATIONS WITH THIS PUMPER. NORMAL WEAR AND TEAR/SCRATCHES/DINGS ANY QUESTIONS CALL TOMMY DELIVERY CAN BE INCLUDED UPON REQUEST/MINIMAL FEE.